As regular readers know, I'm a huge fan of LED's. The death knell of incandescent bulbs has sounded and at some time in the not too distant future, they will join the ranks of 8-tracks and VHS as technologies that were state of the art, but passed by with better options. When I built the new facility in 2008, I was already looking forward to mobile LED's mounted on my Orascoptic 4.8 TTL surgical telescopes. I've since combined them with the Discovery LED that has 7000 foot candles of brightness. Because of that, I chose not to equip the operatories that mainly work out of with overhead track lights as the Discovery, at 7000 foot candles, is much brighter than a track light. However, I did own 3 track lights in the old office and it seemed a waste to just throw them away. So I moved them and had them installed in our 3 hygiene operatories. My thought process being that not all of our hygienists use auxiliary lighting and would benefit from the track lights. Now starting Monday, super hygineist Nikki will begin using the Everlight from DentalEZ. I know that no matter how hard I evangelize about a light on the end of your nose, many practitioners will be more comfortable with a track light. Nikki was using a very old Pelton & Crane unit, but will now be working under the blazing light of 12 high power LED's. The unit was installed on Friday and I'm really excited to see the difference between the old yellowish incandescent bulb and the new bright white LED's. The Everlight is green, using 70% less energy than halogen lights and is economical since the lights last 6 times longer. This new evolution of a standard piece of dental equipment is one of those things that really gets me excited to evaluate. I'll be reporting back on our experiences. 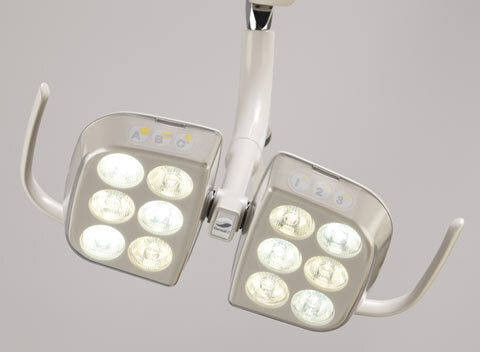 DentalEZ is the first in the U.S. to design an operating light with 100% true direct LED technology. EverLight enables you to work with more precise, direct light without the need for reflectors or fans. Plus, it’s cool, quiet, and environmentally friendly. Proper lighting is only as good as its positioning. The optimal position of EverLight for a supine patient is directly above the patient’s mouth for mandibular and maxillary. Whenever possible, the light should be in the patient’s mid-saggital plane directly above or slightly behind the patient’s oral cavity. A good guide for proper lighting is to keep the light and eye lines within 15º degrees of each other. For lower anterior lingual the best access is slightly behind. (1) Improper lighting contributes to 25% of fatigue. Proper lighting, on the other hand, can increase production by as much as 20%. Correctly positioned operatory lighting minimizes shadows and maximizes effectiveness. Pandora Handheld Comes to Market... but Why? White iPhone on the Horizon? ioSafe Review is Complete... Buy One! The New Gendex GXS-700 Sensors Have Arrived!